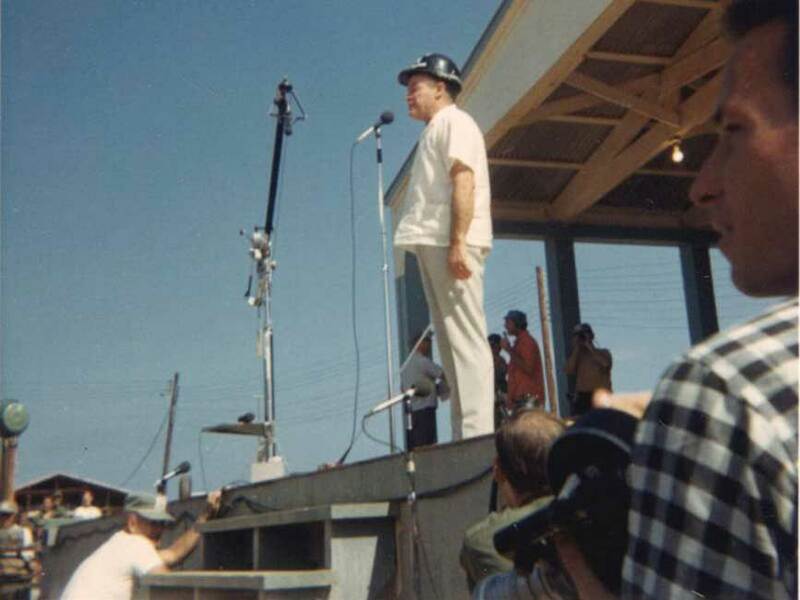 LAUGHS TOO -- Comedian Bob Hope and part of his Christmas troupe as seen by nearly 10,000 screaming fans at the 25th Inf Div's Lightning Bowl. Hope and his bevy of beauties visited the 12th Evac(uation) Hospital after the show. 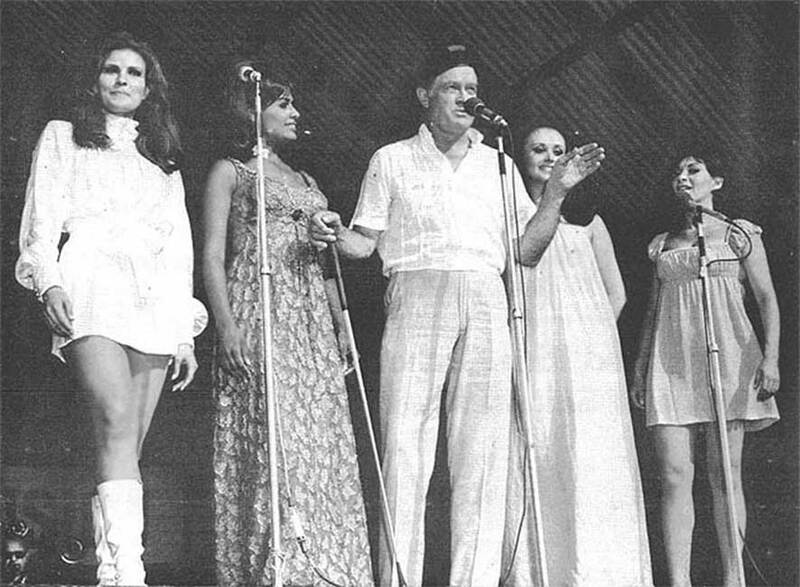 Shown are (from left) actress Raquel Welch, singer Barbara McNair, Hope, "Miss World" Madeline Hartog Bel, and actress Irene Dunn. The Hope aircraft was reportedly fired on while leaving Cu Chi and he later had this comment about the action, "Taking off from Cu Chi they took a couple of shots at us. Even the Cong gets sore when you don't leave the girls behind." 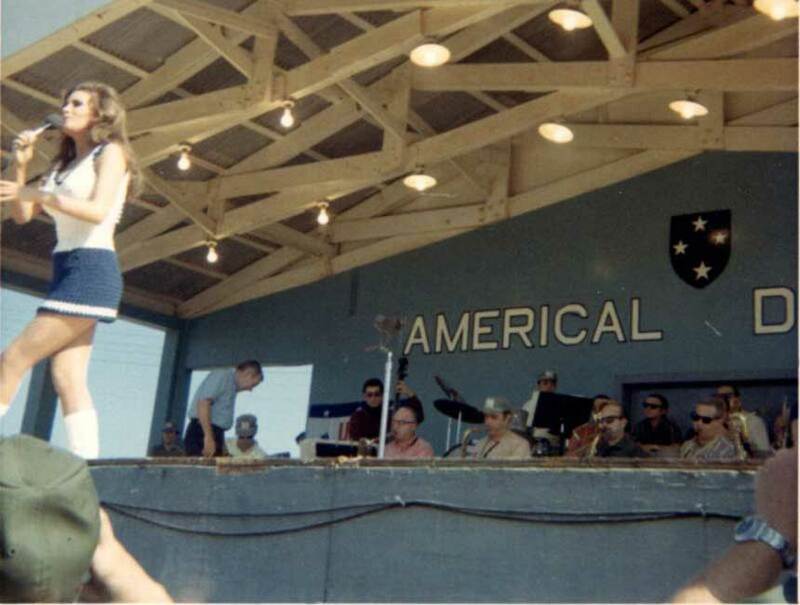 If you're interested in reading my recollection of the USO and Christmas 1967 you may go to http://www.thetentacle.com/ShowArticle.cfm?mydocid=2312. Christmas actually turned out pretty well for me, but it was a bit tougher for those in the combat zone that year. Normie, child that I am, I tend to view the world through rose colored lenses - until I'm absolutely confronted with reality. After reading your essay, I am positively shocked and outraged anew. Thank you so much for bringing this to our attention, Norm! Merry Christmas! 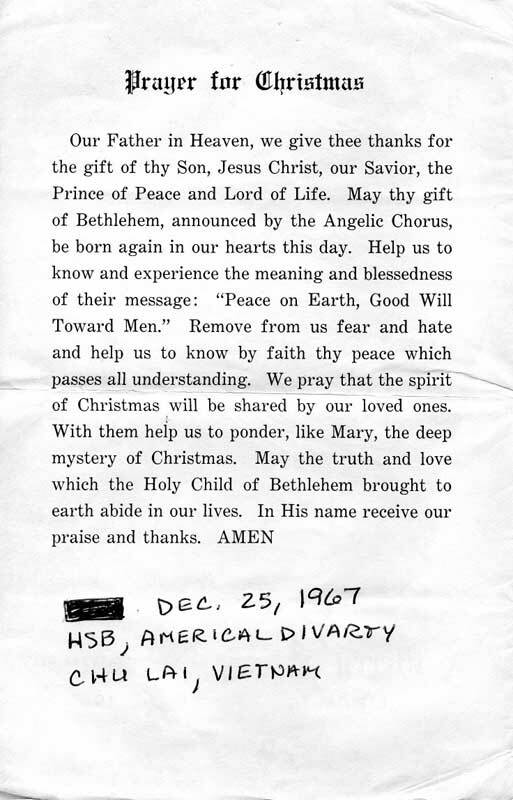 Attached are 4 images of the printed Christmas Day 1967 menu that I received while at Chu Lai, Vietnam. The menu makes the meal sound good but unfortunately the mess hall that we ate at managed to mess up even that meal. The food in that mess hall was the worst that I had my entire time in the Army and that even includes what we got in the field. The best food that I ate in the Army was when assigned to Staff and Faculty Battery during my last year in the Army and that would be followed closely by what I got in Boot Camp, although in boot camp we were not allowed time to enjoy it. 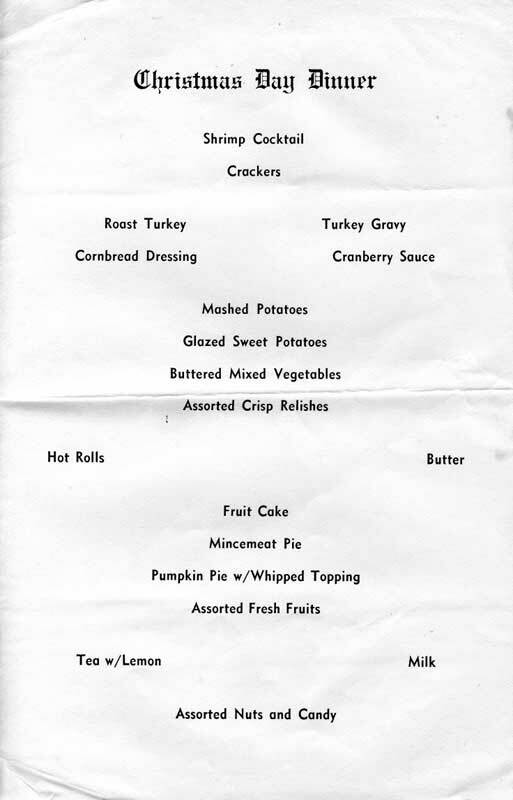 Note the references to God, Jesus and Christians in the text of the menu. I suppose that today that would not be permitted as it would be considered "politically incorrect." This is not one of the areas in which society had advanced today, I think. That is a shame that I think we will regret one day. 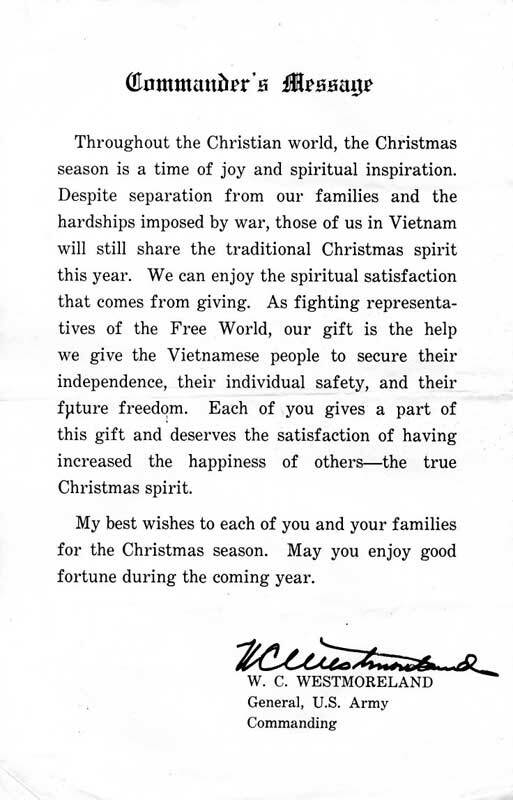 As for Christmas 1967 I had been in Vietnam less than a month and was at that time still assigned to Headquarters/Service Battery of Americal Division Artillery. At first I was very happy to be assigned to that unit as it was in a "safe" location but I soon grew to hate the impossible spit and polish in a sea of red mud, the bad food, working as an electrician rather than a radar tech as I had been trained to be, and being in a combat zone with an aged M14 rifle and a single bullet that I carried in my shirt pocket - aka Barney Fife. By the middle of January I got myself transferred to the 1/14th Artillery and worked as a radar tech in our Countermortar Radar Section. I did then encounter danger to life and limb, but the camaraderie of the guys in the unit which continues even today and many other things made up for that. I then had an M16 rifle and all of the ammo that I wanted, and had access to a number of other weapons whenever I needed them. Even though I was in combat in the Vietnam War, I look back fondly on those days as one of the defining highlights of my life. An aerial photo of where I was for the Christmas Dinner on the menu is also attached. 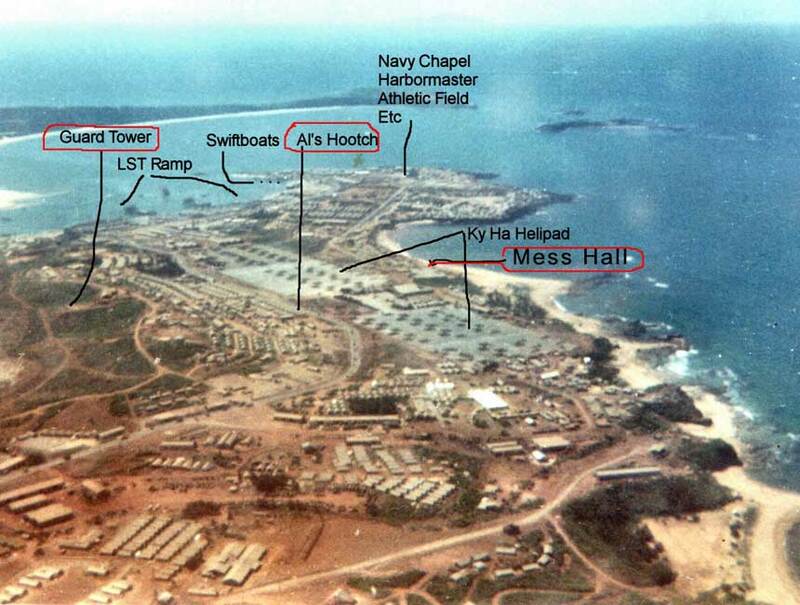 You will see that several places are marked on the photo - the infamous mess hall, my hootch, and a perimeter guard tower where I spent most of the day and night on Christmas 1967. That day was the only time during my 6 weeks at Division Artillery that I did have ammunition, and was also the only time during my year in Vietnam that I pulled an official guard duty shift. We also had an M60 machine gun, a weapon that neither of us in that guard tower had ever loaded or fired. Thankfully we did not need to use it. Later on when assigned to the radar section, I learned to use an M60 and a lot of other weapons, too. All of the pictures have been published in the Americal Division Veterans Association magazine. WOWZERONI! This certainly gives one pause for thought about many different things! Thank you so very much, Al - for everything! 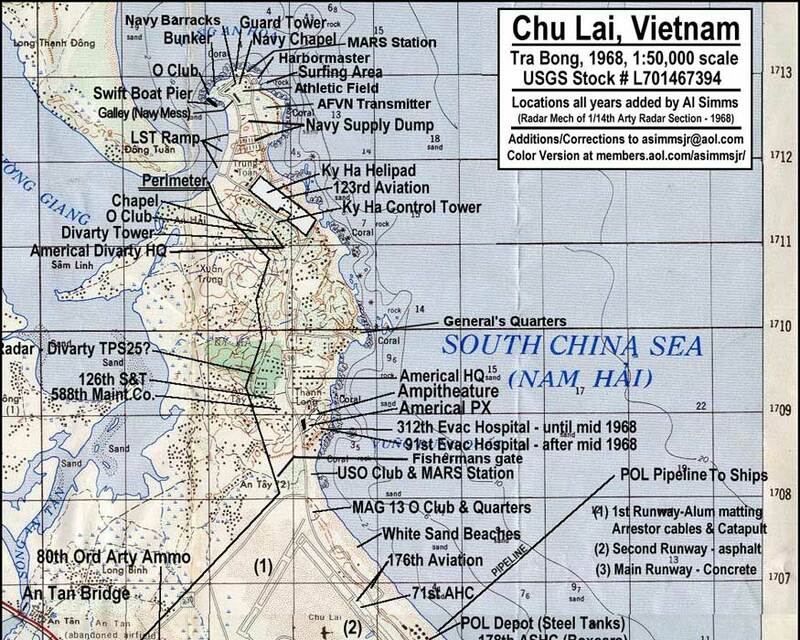 Attached is a map of Chu Lai in two pieces that has many things marked on it including the main USO - look at the southern end of the North Ky Ha peninsula on the beach and you will find it easily. There were other clubs and perhaps even another USO but I am pretty sure that this was the main one and was located there throughout most of the years that we had a base there. As for where the "fixes" to fire on came from many of them came from my own radar section. When we were at Chu Lai they probably all went thru you since we reported them to CLDC but during the 7 months that we were in the field we usually gave them directly to the Arty FDC on our hill. Many times they fired on them as soon as we gave them to the FDC. They may have been supposed to go thru you but I think that many times, especially if they were hitting us, they did not take the time to do that because if they had the mortars would be gone by the time that they got clearance. That may have been stretching the combat contact mission permission a bit but we had to do what we had to do to "take them out" and get them off of us. 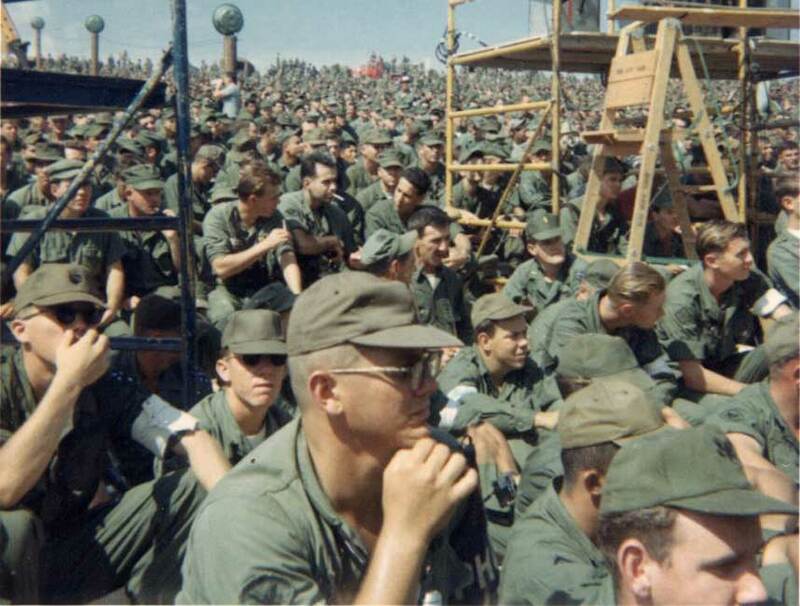 Re your 20 day trip to Nam on the ship: Did you come over on the USS General Walter H Gordon with the 198th Brigade? My unit did, although I came a little later in late Nov by air - 20 hours instead of 20 days! 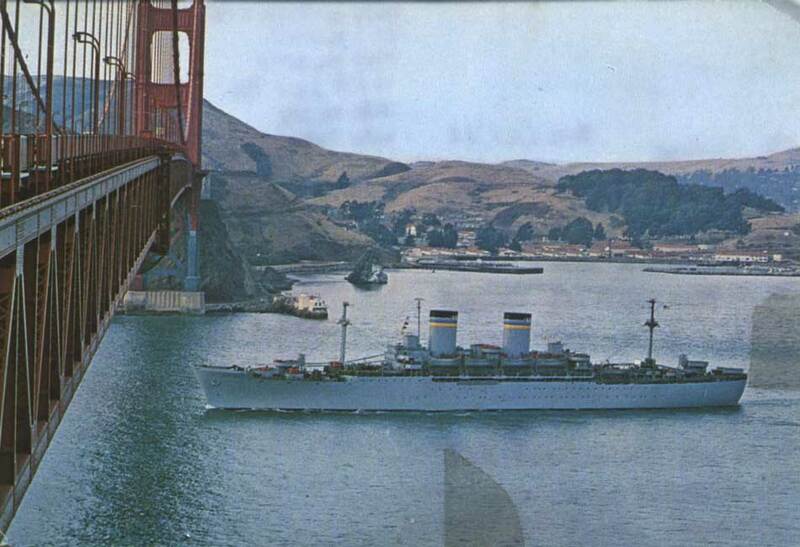 Picture of the USS Gordon is attached. 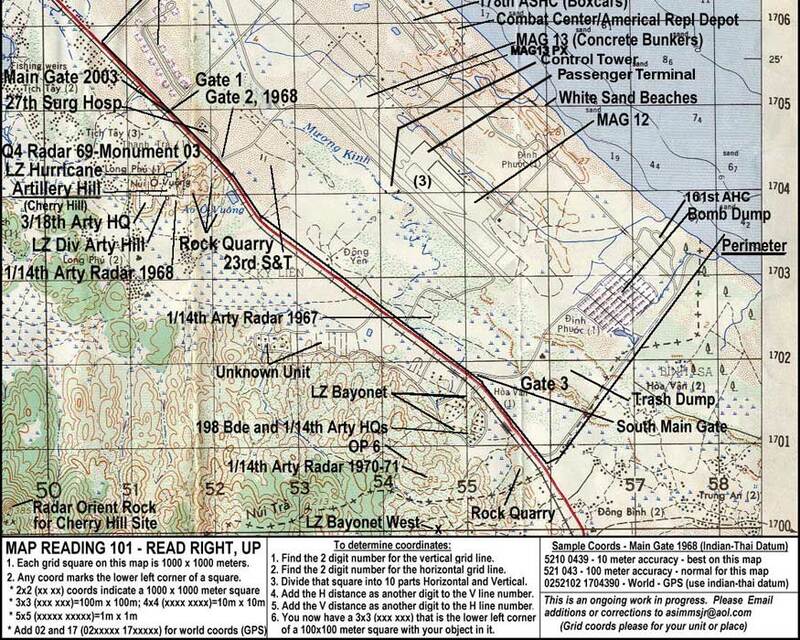 As for your unit location I am pretty sure that it was on the east (seaward) side of Ky Ha not far back from Rosemary's point. There was a very tall radio broadcasting antenna there that your unit may have had some involvement with. It was also a very restricted area or at least part of it was. A photo showing the antenna is attached. The Antenna is just about dead center of the small photo. I was there for the entire TET68 offensive since I did not leave Vietnam until December of 1968. I don't know if you know this or not but we (the USA) almost completely destroyed the Viet Cong during that offensive and they never really recovered from it. After that the North Vietnamese Regular Army began moving south and took over the fight. Three pictures that I took at the Bob Hope show are also attached. I was on a cue card handling detail and because of that had a front row seat just off to the right side of the stage. Also met Bob Hope at the airport to pick up the cue cards. Carol, please note that I have also sent this email directly to Phil, just in case you don't want to burden your website with all of the maps, photos and old soldier stuff. and as a small thanks for the sacrifices of y'all and so many others! Regarding Al Simms ('60 - of VA) and Phil Hammond 's ('64 - of UT) recollection of Chu Lai, I thought I sent the attached picture last year. I found it last November (2007) while researching a Christmas commentary on the USO and it's support of our troops in Iraq and Afghanistan. I couldn't find it on the NNHS site; it may be among your temporarily lost images (I trust). 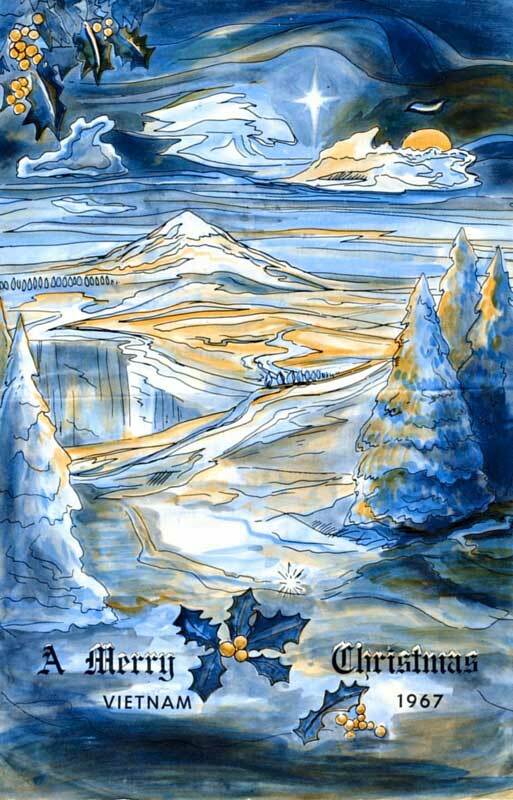 Merry Christmas to you, all our classmates and especially those who served and still serve our great nation on the frontiers of freedom. but you have thoughtfully restored it to us! Thanks so much!